We've shopped at many good geocaching stores, but we wanted to offer some deep discounts, special items, and some one-of-a-kind unique caches to the caching community. So we opened up this online store, and made the decision not to sell on any other sites or locations. We pledge to strive to continue offering the best prices on the products you want. "Wow! I love surprise Pathtags! I also love the design on this tag, it is very nice. Not only did I get the best prices I have ever seen for caching supplies [but I also got] the coolest bolt/bison like tubes that I have not even seen offered anywhere else before; I am sure would have been 4X the price. I also got a free very cool container that I have not had before either! Isn't it fun when things like this can make your whole day! Thanks drives! I will be telling everyone that they need to check out your website and that your customer service is the best!" Thanks again, Be Safe and Have Fun! 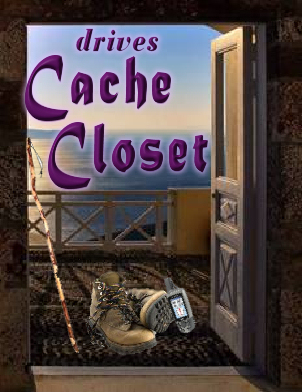 drives Cache Closet - Our products are designed with the geocacher in mind. Here in our closet, we want you to browse around and take advantage of what we consider to be deep discounts on containers and other items to make your geocaching experience the best.